BP Aero is recognized as the leading service provider for commercial aircraft engine disassembly and part identification. We differentiate ourselves by treating each engine, module and individual part with the upmost care. 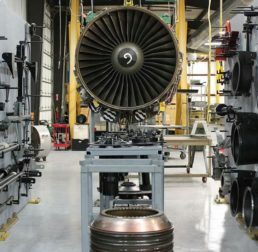 Engine disassembly requires highly skilled individuals to follow the OEM’s critical instructions while managing thousands of individual piece parts in the process. BP Aero values the trust and loyalty our customers grant us and we strive to enhance their experience with each engine we induct. Since inception, BP Aero has continued to invest in people and equipment to ensure we continue to be out front as the leading service provider for engine disassembly. In 2017 BP Aero built a new 100,000 square foot facility with a strategically designed layout to maximize efficiency of the engine teardown process, from start to finish. We now have the ability to hang five engines at once while minimizing the touch time required to move tooling, equipment or parts during the engine disassembly process. Our goal for the new teardown location was to increase productivity and responsiveness while giving our customers peace of mind that their assets will be safe while in BP Aero’s care, custody and control. Our customers benefit from BP Aero’s commitment to providing the best teardown service in the industry. We have dedicated inspectors and dropshipping teams to ensure priority material can be safely & quickly routed to repair/sale from BP Aero’s facility.